Working and living in New York is not easy. I am often asked how I managed to move to the US. I always give the same answer: it is difficult. Getting a visa can be complicated, especially when it comes to a work visa. Without a residence permit (Green Card) or a visa granted by the government of the United States, you will not be able to get a job and stay in New York legally. 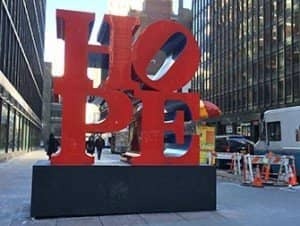 Living in New York is a dream for many. It was for me, at least! Needless to say it wasn’t easy. If you are an Auatralian citizen, you will be able to stay in the US for a maximum of 90 days with an ESTA. Please note that the ESTA does not give you the right to work in the United States. What did I do? I went to New York with my savings and I stayed there for three months. During my first stay I couldn’t work (I didn’t have a work visa), but I got to know the city very well. 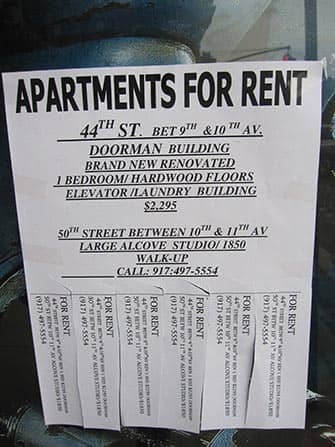 Renting apartments in New York, is difficult: you’ll first need to prove your salary is 40 to 45 times the monthly rent. Your payslips/contract will be checked to make sure you can pay your rent. They will do some background checks as well. 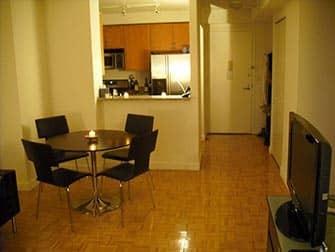 Prepare to pay one month security deposit, first month rent and last month rent, so three months, upfront. The best time to start looking for a new place is 4-8 weeks before you intend to move in, don’t start too early. Usually you get a one year contract but no longer than two years. There are different ways to find an apartment in the city. You can search for apartments via an agency, through Google, through Craigslist or by responding to a “for rent” sign on the facade of an apartment building. The last two options are often less restrictive and it might be easier to rent through them but beware of scams. For shorter stays (a couple of months) you might want to have a look at Airbnb. Know that when you go via a realtor you often have to pay one month’s rent as a commission to them. Costs of living in New York can get high as it’s an expensive city so it might come in handy to know how much you will spend each month. 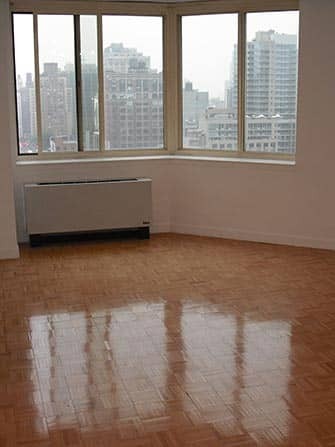 In Manhattan a reasonably priced studio will cost you around $2100 per month and a one bedroom apartment $2700-3000. In Brooklyn it is hard to find a studio under $1500. Many people in New York share a flat. If you prefer this option, you will pay about $800-$1000 per person in a shared apartment in Queens or Brooklyn. Gas and electricity come on top of your rent and you might end paying $100-$200 per month. You will also need a mobile phone when you move to the city. The cheapest subscriptions range between $40 and $80 and if you want to have internet access you can end up paying $120. Something you will definitely need, to get around is a MetroCard. A 30-day pass will cost you $121 and you will get unlimited travel in both the subway and local bus rides. Groceries can be expensive too, but this varies a great deal depending on the person and the area where you live in. In Manhattan supermarkets tend to be pricey. Sometimes a takeaway will be much cheaper than buying your own food. An Asian takeout might be $6 and often you will have leftovers for the next day. Count on about $50-$100 per week per person on groceries. I did not include health insurance for a reason: it is very personal. If you are planning to be in New York for a couple of months only, you might be covered by your insurer back home. If you work in New York, your employer might or might not contribute to your health care plan. Health costs are very pricey in the US, so make sure you are covered to enjoy a worry-free stay. 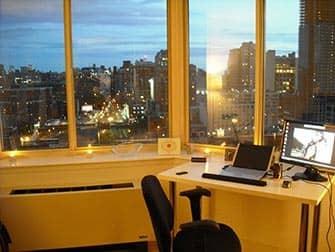 To work in New York you will need a work visa or a Green Card. These can only be issued by the authorities (US embassy or consulate) before you travel to the United States. How to get one? You will need a US-based company that will sponsor you. This means that when you apply for a job in the US, the company will need to support your visa application. Without a sponsorship it is extremely difficult to work in the US. Another way to get a visa to live and work in the US, is through the Green Card Lottery. Every year the government grants 50,000 immigrant visas. Please check if your country is entitled to participate in the annual visa lottery. Every year the list of eligible countries changes. If you need help to prepare your application, please read here. Alternatively, you could start your new business in the US, but keep in mind that you will need a substantial initial investment to do that. Check with your embassy about the specific requirements for this type of visa. If you plan to study in New York you will need a student visa. There are two kinds: the F-1 (for academic students) and the M-1 (vocational training). To get one of them, you will need to enrol in a course from an institution recognised by the government. Once you are enrolled, the school will send you an official form (DS-160) that you will need to fill in, in order to apply for your visa. You will also need to show a valid passport and prove you can support yourself financially during your stay. You will need an average of $10,000 during your stay. This includes travel expenses from and to your home country, books and rent. Additionally, you will have to pay an administrative fee (SEVIS, around $200). You will need to pay this directly to US Department of Homeland Security by credit card. A student visa does not allow you to work in the US. Eric’s Tip: I run www.NewYork.com.au but I am not an expert in residence permits or visas to the US. I strongly advise you to check the specific requirements to enter the US from Australia. Every country is different, so please make sure you are well-informed before you travel to New York. You can read more about entry to the United States of America here. Contact your local embassy for further information. Unfortunately I cannot offer internships/jobs at this time though I appreciate your interest.